Accelerate turnaround time while minimizing risk. Electronic signatures are lawful in most global jurisdictions for the vast majority of agreements. 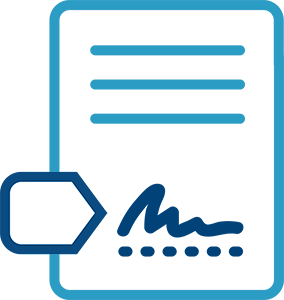 Once an agreement is electronically signed, DocuSign secures the document and signatures with a tamper-evident seal. An executed agreement includes a court-admissible Certificate of Completion, as well as party names, email addresses, public IP addresses, and a time-stamped chain-of-custody audit trail that records all important document activity — exceeding what is possible with paper-based agreements. The DocuSign System of Agreement platform simplifies and accelerates agreement preparation, execution, and management, reducing the cost of administrative tasks, such as printing, faxing, scanning, overnight mailing, and storage. And it integrates seamlessly with legal document management systems, digital electronic signature technologies, and existing processes. DocuSign is committed to security excellence, which includes physical security, platform security, and security processes. We ensure privacy by managing customer data only on the customer’s behalf, and in accordance with the customer’s instructions. We adhere to the most stringent internationally recognized security, privacy standards and regulations, then validate those standards continuously through our robust compliance certification program. Our focus on security, compliance, and privacy reduces risk and improves law firms’ ability to track, access, audit, and properly retain agreements.